11 January marks the anniversary of the outbreak of the First Anglo-Zulu War in 1879. For many years there had been disputes on the borders of lands held by the Zulus and a number of incidents ended in the Zulu king Cetshwayo being given an ultimatum, which he ignored. The British invasion of Zululand was led by Frederick Thesiger (Baron Chelmsford), who badly underestimated the Zulus. British forces lost heavily at Isandlwana and barely managed to defend Rorke’s Drift and were eventually forced to retreat. 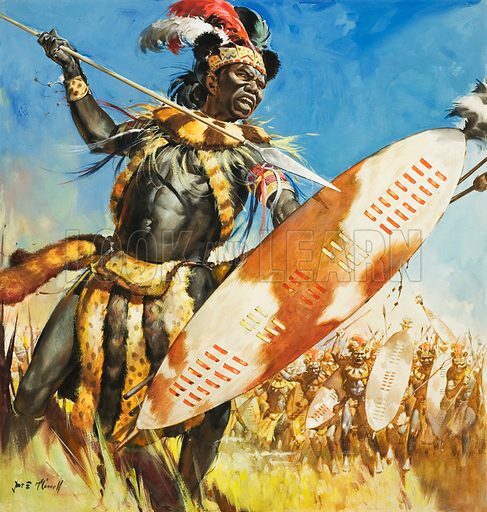 After being reinforced, they invaded again and the Zulus were defeated and the Zulu army dispersed. Cetshwayo was eventually restored to his throne in 1882 by the British Government. Many more pictures of the history, culture and wildlife of Africa can be found at the Look and Learn picture library. Click on the link or picture to find out more about licensing images for commercial and educational use. 11 January is the anniversary of the first ever milk bottle deliveries in 1878. Milk had been delivered earlier, but only to fill jugs owned by customers. The milk bottle was developed and patented in 1877 and the New York Dairy Company is said to have had the first factory producing milk bottles. In Britain, the first milk bottles were produced by the Express Dairy company in 1880, originally with a porcelain stopper held on by wire and deliveries were made four times a day. 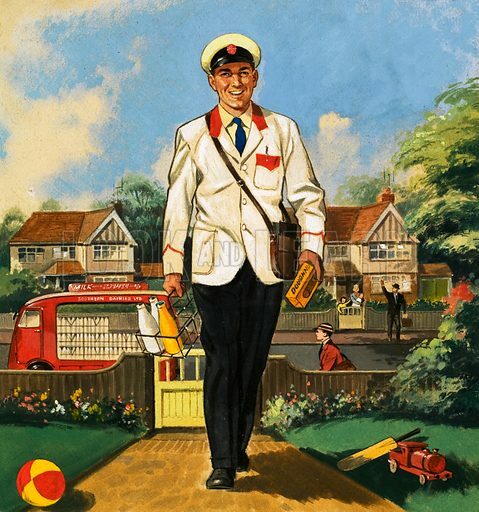 Nowadays, thanks to most houses having fridges and cars (which has increased the level of supermarket shopping), the sight of a milkman on his early morning rounds is becoming increasingly scarce. Many more pictures relating to milkmen and milk deliveries can be found at the Look and Learn picture library. Click on the link or picture to find out more about licensing images for commercial and educational use. 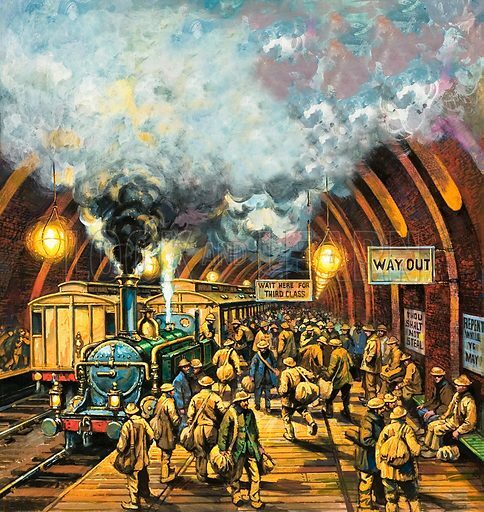 10 January marks the anniversary of the opening of the London Underground in 1863, the first rapid transport underground railway system in the world. In 1890 it became the first system to operate electric trains. The Underground – of which some 55% is actually overground – has 250 miles of track, 270 stations and carries roughly 3 million passengers a day. Many more pictures relating to railways throughout the ages can be found at the Look and Learn picture library. Click on the link or picture to find out more about licensing images for commercial and educational use. 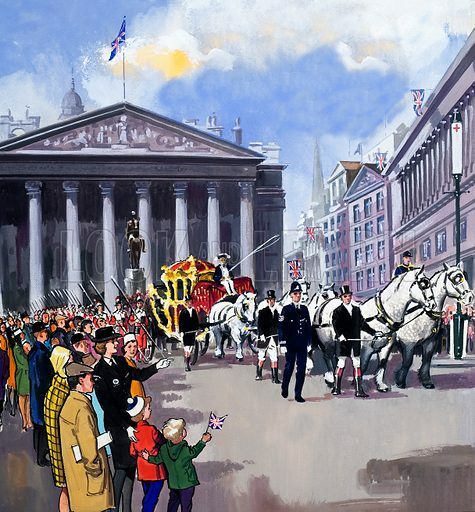 10 January marks the anniversary of the destruction of the Royal Exchange designed by Sir Christopher Wren in 1838. 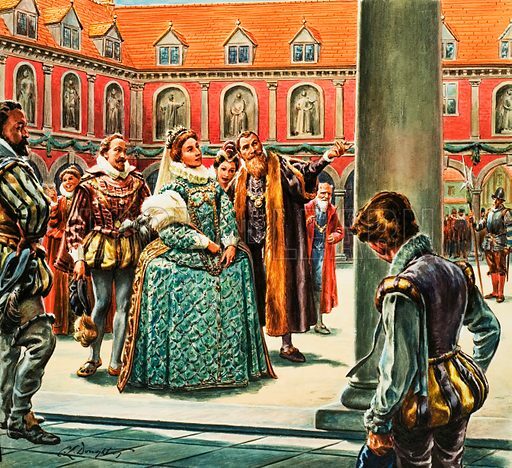 The original Royal Exchange was opened by Queen Elizabeth I in 1571, having been founded by Sir Thomas Gresham in 1565. The original building was destroyed in the Great Fire of London in 1666 and a second, Wren-designed Exchange was opened in 1669, only to be destroyed in 1838. The third Royal Exchange, designed by Sir William Tite, was opened by Queen Victoria in 1844. It ceased to be a centre of commerce in 1939 and is nowadays a shopping centre. Many more pictures relating to architecture throughout the ages can be found at the Look and Learn picture library. Click on the link or picture to find out more about licensing images for commercial and educational use. 9 January marks the anniversary of the destruction of RMS Queen Elizabeth by fire in Hong Kong harbour in 1972. The ship was launched in 1938, named after the Queen Consort, and made her maiden voyage in 1940 as a troopship during the Second World War. 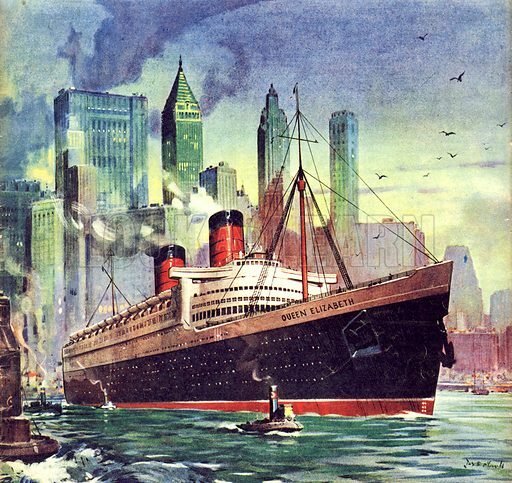 The ship went into service as a Royal Mail carrier and a passenger liner – the largest built at that time – for the Cunard liner. Along with her sister ship, Queen Mary, she was replaced by the RMS Queen Elizabeth 2 in 1969 and sold to an Hong Kong businessman. Intended to be used as a cruise liner, the ship caught fire and capsized whilst undergoing refurbishment. Many more pictures relating to boats and ships through the ages can be found at the Look and Learn picture library. Click on the link or picture to find out more about licensing images for commercial and educational use. 9 January marks the anniversary of John Jervis, 1st Earl of St Vincent and Admiral of the Fleet, in 1735. Born in Meaford Hall, Staffordshire, Jervis ran away and joined the navy at the age of 13, returning when he heard that his family were upset at his disappearance. He was subsequently allowed to join as an able seaman in 1749. After involvement in various battles (including the American War of Independence), he returned to England and took up political office. 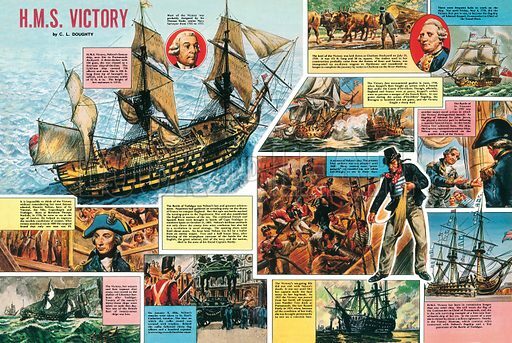 He resigned in 1794 and subsequently became commander of the Mediterranean Fleet, taking HMS Victory as his flagship. Jervis retired in 1807 and sat in the House of Lords. He died in 1823. Many more pictures relating to the Royal Navy can be found at the Look and Learn picture library. Click on the link or picture to find out more about licensing images for commercial and educational use. 8 January marks the anniversary of the Battle of Ashdown in which Alfred the Great defeated Danish invaders in 871. 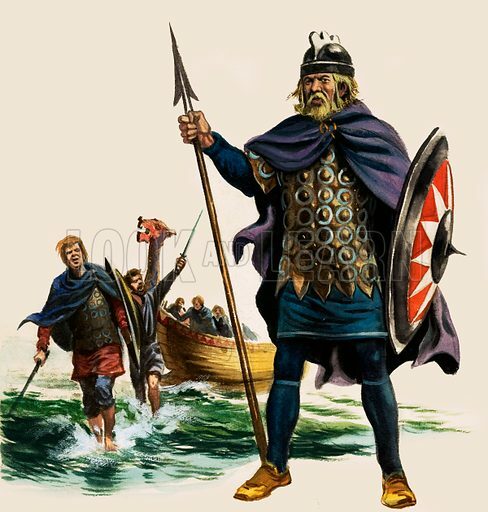 The Danes were full of confidence from their successful invasion and were prepared to attack the retreating Saxons. Alfred, then a prince aged 21, summoned the scattered West Saxon army of his brother, King Ethelred, and led them into battle. Although he sustained heavy losses, he was able to push back the Danes, killing one of their kings (Bagsecg) and five Earls. It was not a complete victory, however, and the Danes were able to regroup and defeat the Saxons at Basing later that month; Ethelred was killed in a subsequent battle in March and Alfred succeeded to the throne. It was not until 878 that Alfred was able to finally force the Danes to withdraw from England. Many more pictures of famous historical battle can be found at the Look and Learn picture library. Click on the link or picture to find out more about licensing images for commercial and educational use. 8 January marks the anniversary of the French explorer Rene-Robert Cavelier, Sieur de La Salle’s arrival at Niagara Falls in 1679. 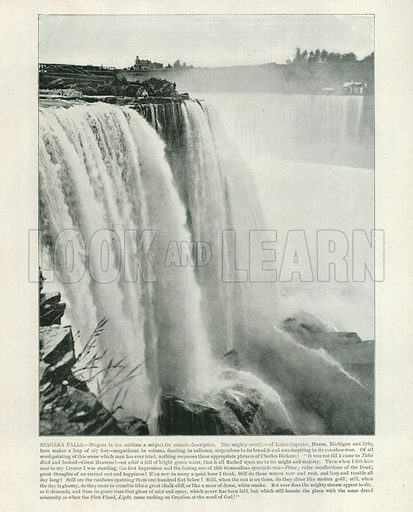 Although they had previously been discovered, he was joined on his expedition by Father Louis Hennepin and it was Hennepin’s description of the falls that brought them to the attention of Europeans who made the falls a major tourist attraction. The falls are amongst the most spectacular in the world and have been immortalised many times. 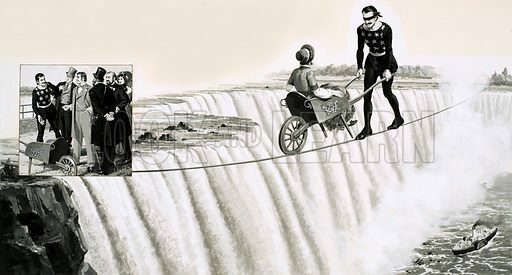 Blondin crossed them on a tightrope, Marilyn Monroe starred in the movie Niagara Falls and many have tried to ride the falls in a barrel. Most of them have died or suffered severe injuries. Many more pictures of waterfalls can be found at the Look and Learn picture library. Click on the link or picture to find out more about licensing images for commercial and educational use. 7 January marks the anniversary of the first crossing of the English Channel by balloon by Jean-Pierre Blanchard and Dr. John Jeffiries in 1785. 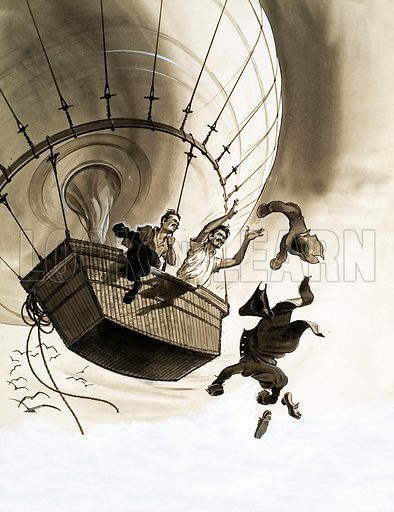 Blanchard, wanting to save the glory for himself, had hoped to make the crossing alone and loaded his trousers down with lead weights in an attempt to prove that the balloon would not take off with two passengers. The angry Jeffries, who had financed the balloon, realised he was being tricked and Blanchard was exposed. He was also exposed a little later during the flight. The two men took off and Blanchard, worried about the additional weight, began throwing everything he could out of the basket – oars (Blanchard was convinced he could row through the air), a propeller and brandy casks were disposed of. Still the balloon sank towards the sea and Blanchard ordered Jeffries to take off his coat; he then began removing his other clothing and throwing it overboard. Fortunately, a gust of wind lifted the balloon sent the balloon soaring upwards and the two freezing balloonists were carried over Calais to a field 12 miles inland. Many more pictures relating to the early history of flight can be found at the Look and Learn picture library. Click on the link or picture to find out more about licensing images for commercial and educational use. 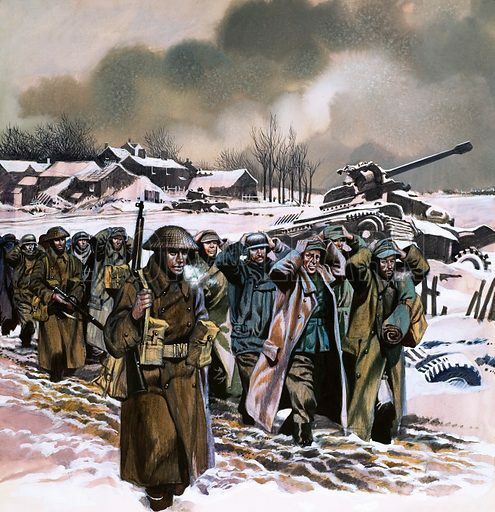 7 January marks the anniversary of the end of the Battle of the Bulge, also known as the Ardennes Offensive, in 1945. It was one of the final German attacks of the Second World War, launched through the densely forested Ardennes Mountains region in Belgium. Launched on 16 December 1944, and led by heavy bombardment and a sharp thrust by German Panzer divisions, the Allies were taken completely by surprise and were driven back, hence the name: the ‘bulge’ being the shape of the initial incursion as seen on maps in contemporary newspapers. Eventually the Allies were able to push the Germans back and, on 7 January, Hitler signed an order to withdraw forces from the Ardennes. Many more pictures relating to the history of the Second World War can be found at the Look and Learn picture library. Click on the link or picture to find out more about licensing images for commercial and educational use.